Don’t monopolize time .. Give everyone a chance to speak Turn off cell phones and pagers Respect everyone’s ideas .. you don’t have to agree but be positive and constructive when disagreeing Don’t carry on ‘side bar’ conversations What is said in the room .. Stays in the room Be open to new ideas and ways of thinking One conversation at a time Stay on time for breaks and lunch Have fun ! 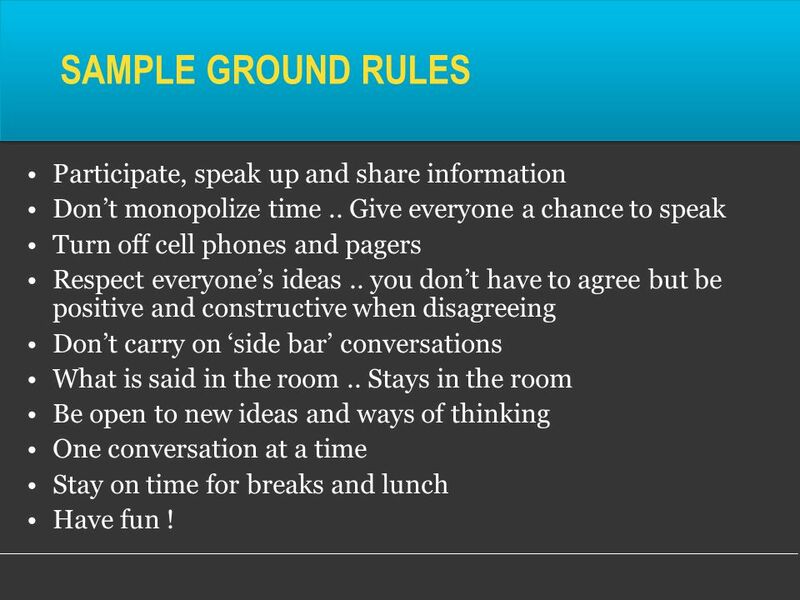 8 OUR GROUND RULES FOR TODAY …..
March break ? Size of room, layout Where Time of day Accessibility (public transit) Parking Projects Flip charts, markers Refreshments Schedule Facilities Logistics OTHER IDEAS ??? Labour negotiations – Union and management representatives will be meeting to renegotiate the contract that is set to expire. 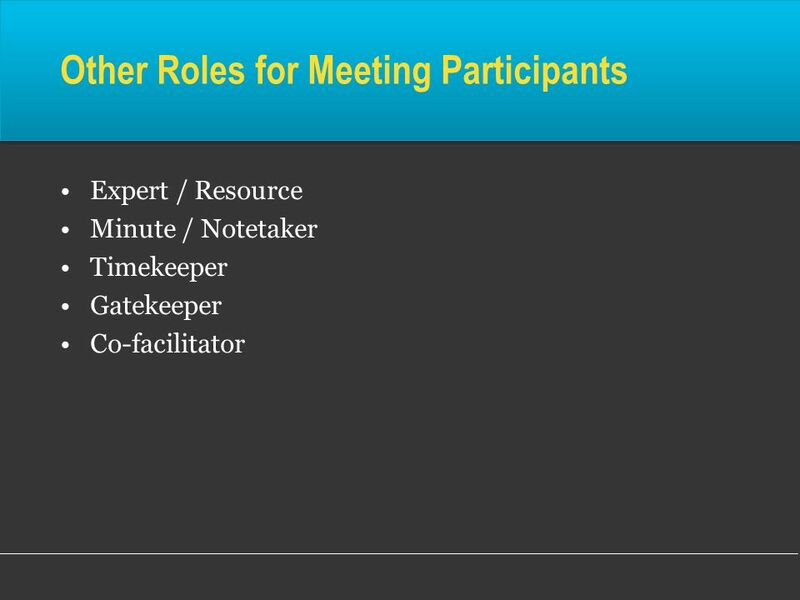 What would be the implications of having a facilitator run the meetings? How would the parties decide on a facilitator? 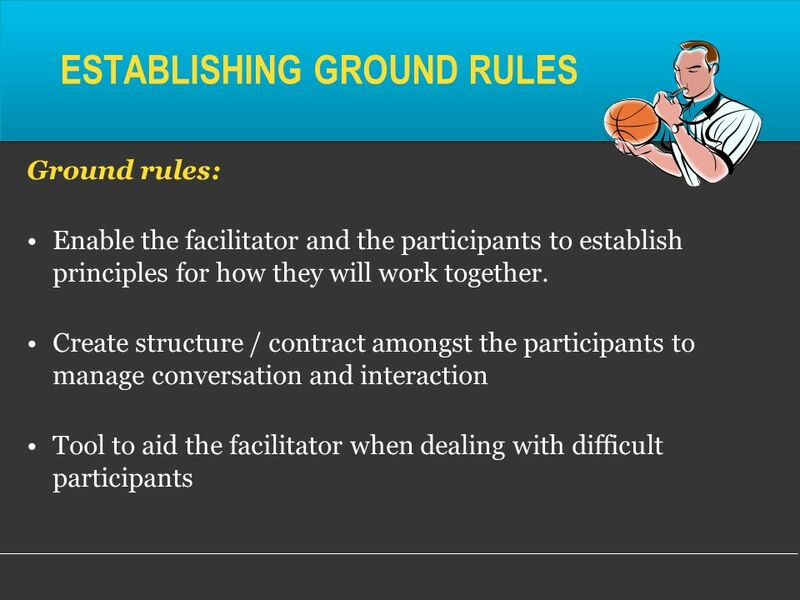 What would the scope of authority be for the facilitator? How would this be different than a mediator? How would the meetings differ if the parties are on good terms versus tense terms? In a potential strike situation? 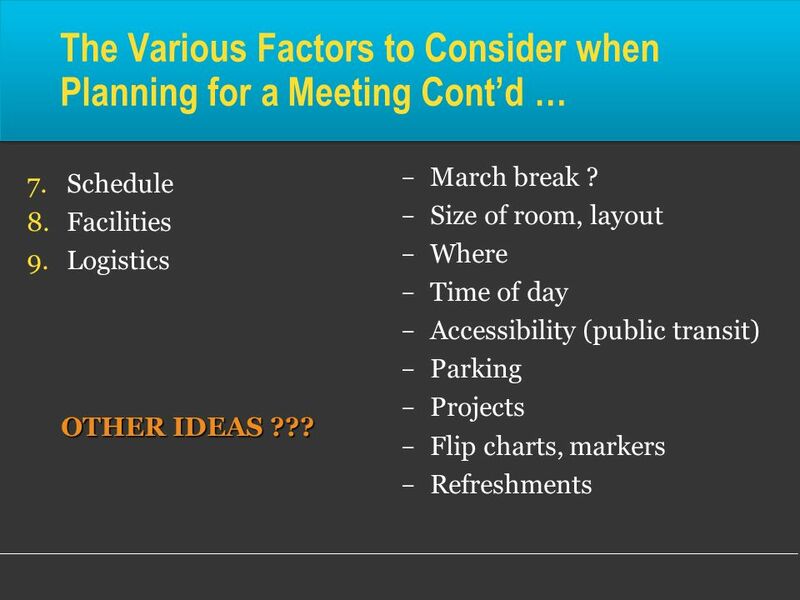 Where would the meetings be held, and what would be required of the facilities? A staff person has just been fired or suspended – Should there be a meeting? 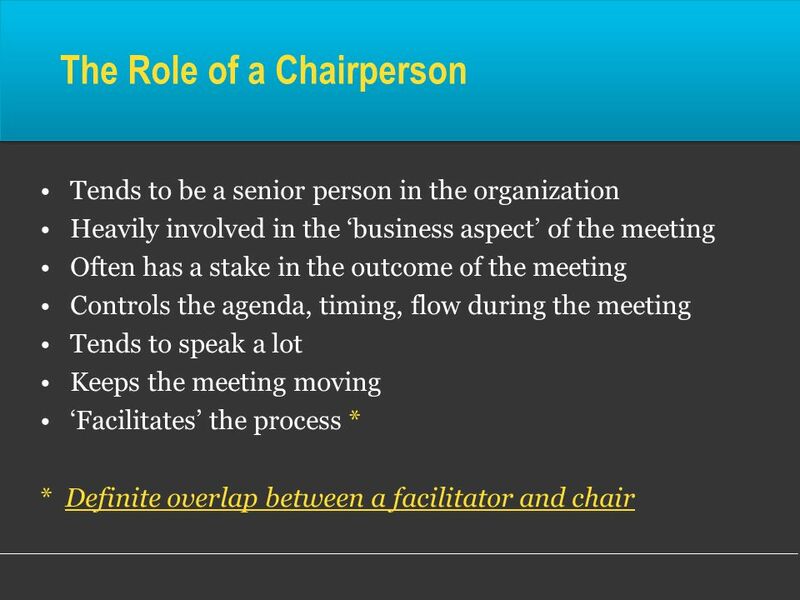 If so, what roles would a leader and/or facilitator play in a team or all-staff meeting? 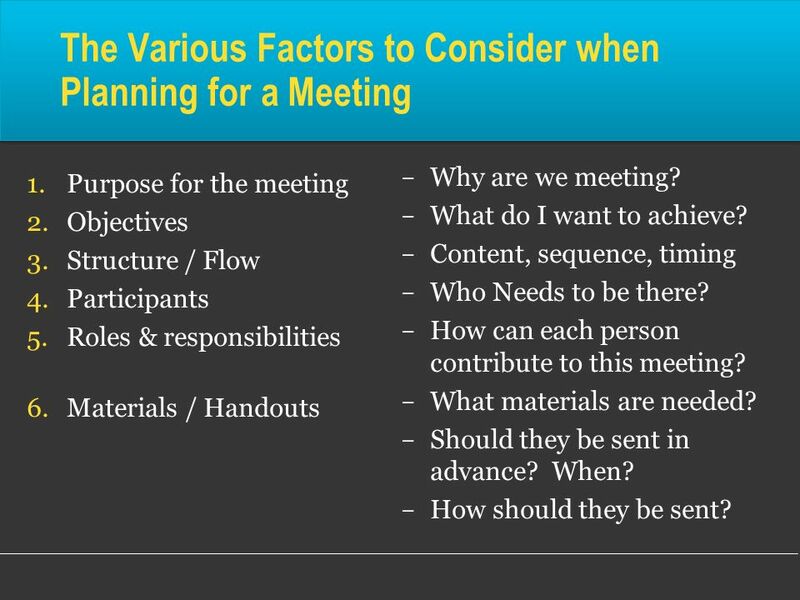 What would the purpose of the meeting be, and how would it be achieved? Who should be invited? How would the room be arranged? How would the considerations vary if the person was fired for insubordination, laziness or failure to fulfill duties, discriminatory or other inappropriate behaviour with colleagues or clients? What if the organization has under 12 staff versus over 50? What if the person who left was a volunteer instead of an employee? Multiple agencies are partnering on a Trillium Foundation application and they have not worked together closely on other projects – Who should attend the meetings? 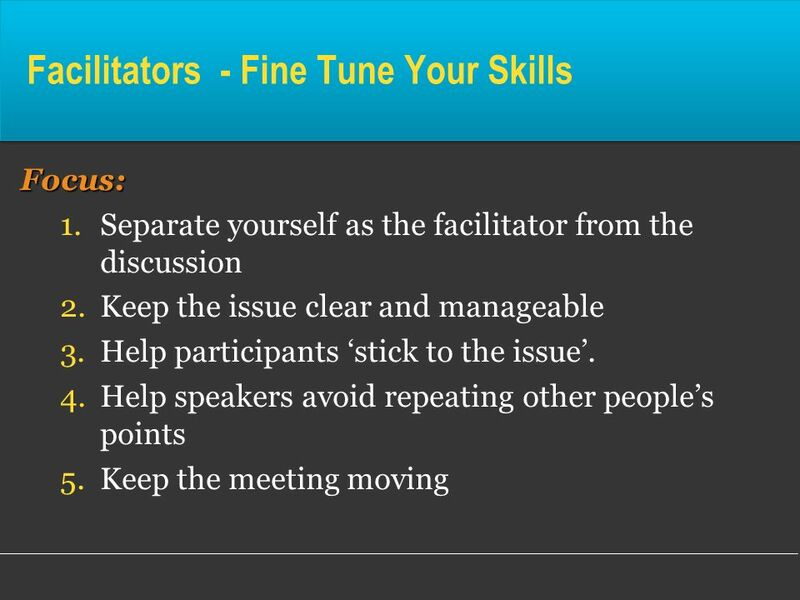 Should there be a facilitator or a leader to run the meeting? How would the person(s) be selected? What decision-making approach will you use and how will it be determined? 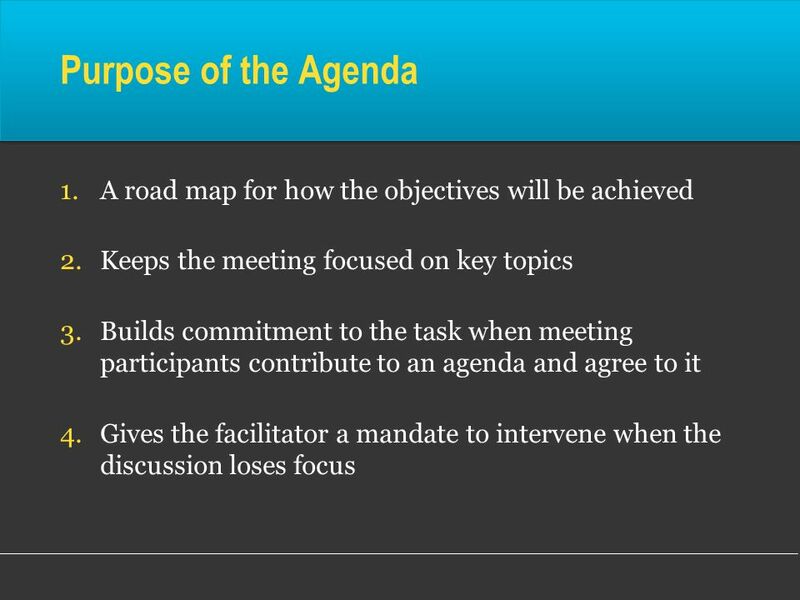 Who would establish the purpose, the agenda, run the meeting, conduct the follow up? 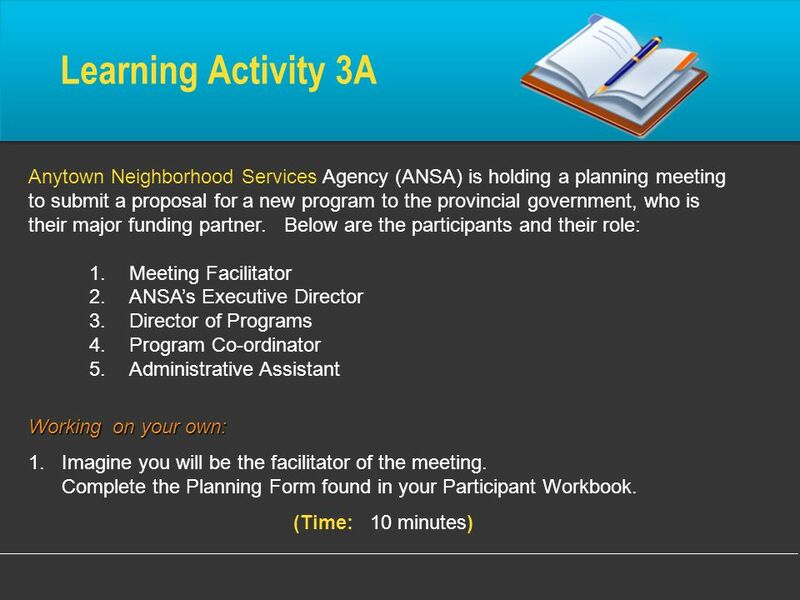 What are the considerations for the organization that will host the meeting? How will expenses be handled? 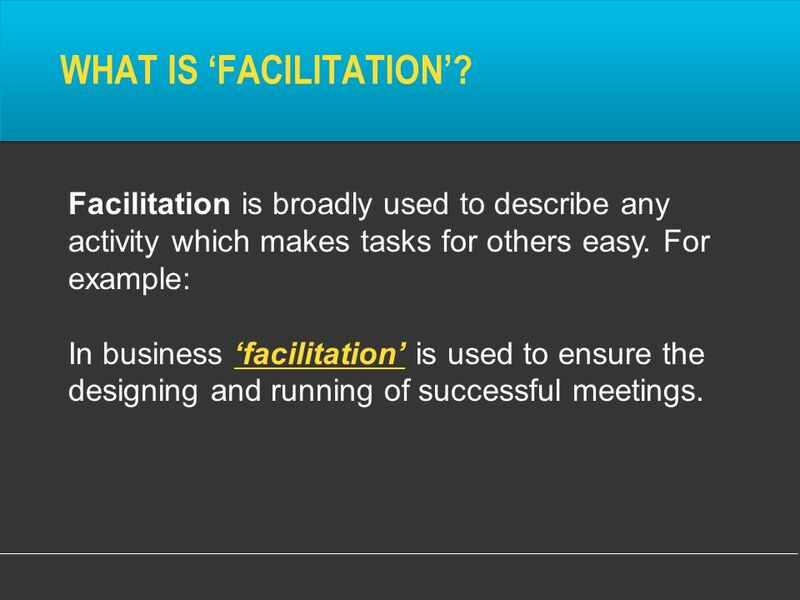 Facilitation is broadly used to describe any activity which makes tasks for others easy. 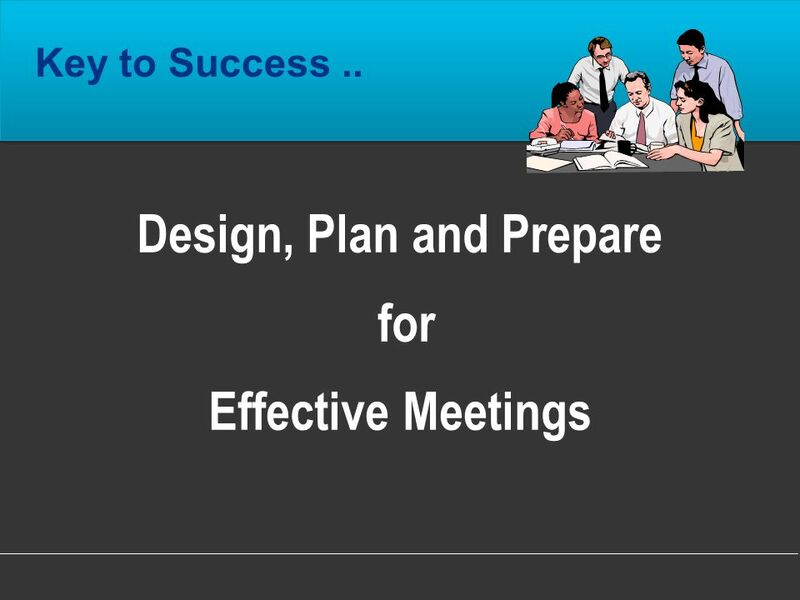 For example: In business ‘facilitation’ is used to ensure the designing and running of successful meetings. 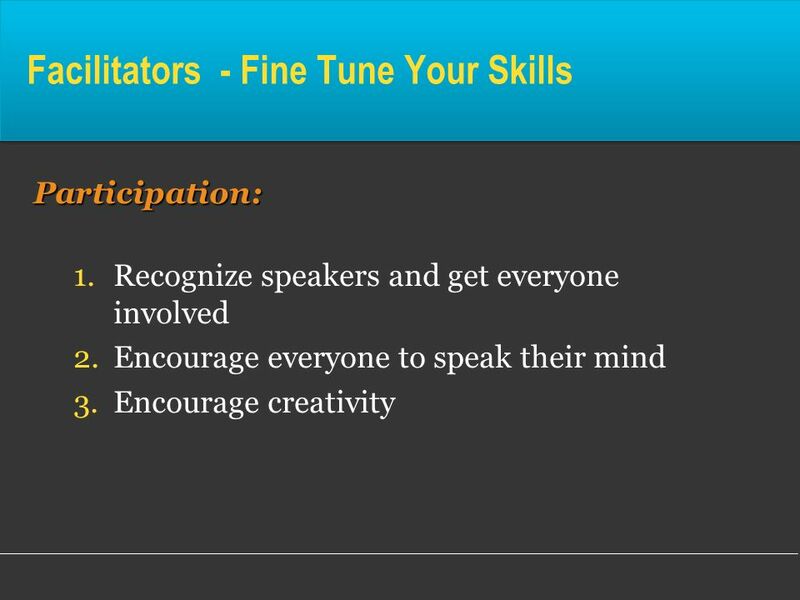 Provides the opportunity to create an environment where the full contribution of each and every member of the group is allowed, encouraged and supported Provides the opportunity to tap into the hidden potential of all employees or group members Enables the organization to create an atmosphere where: People are encouraged to participate actively and to think creatively. People are involved in problem solving and decision making. People see themselves as partners and have a strong sense of responsibility and commitment to the process Trust and integrity is built and nurtured through an open and caring flow of information. 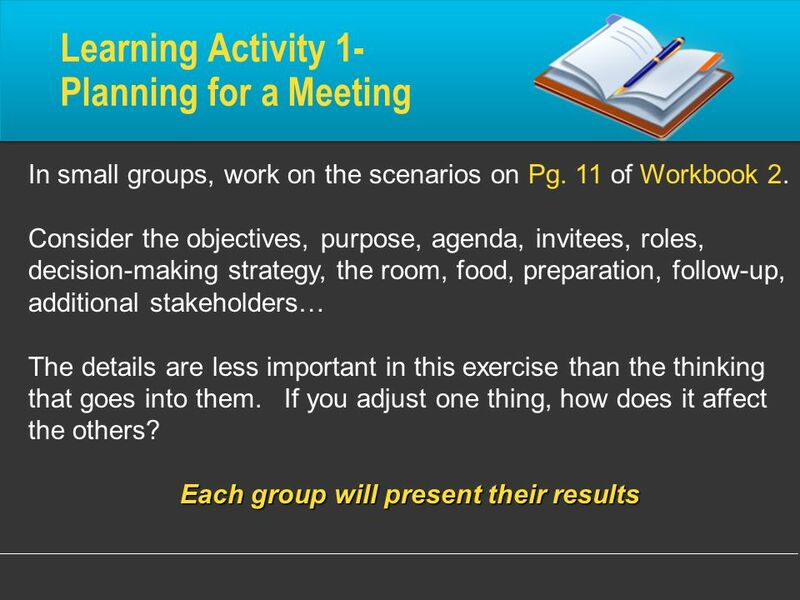 Learning Activity 2 – Reflection Can I Facilitate ? … Take a moment to answer these questions for yourself Are you willing to listen to others without judgment or preconceived notions about what they should or shouldn't say or do? Do you show respect for the opinions of others even when they disagree with you? 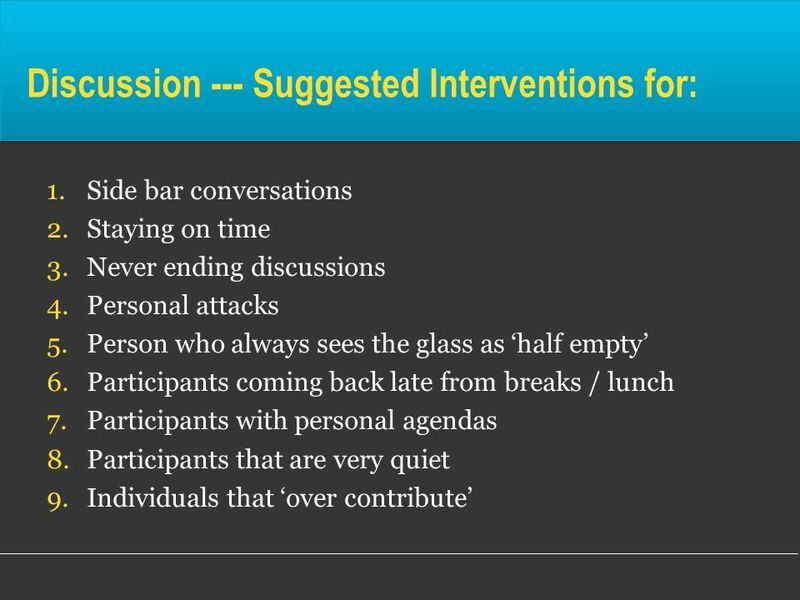 Can you release the need to have complete control of a conversation or other situations? Are you comfortable dealing with conflict? Are you comfortable speaking in public? Are you able to laugh at yourself? Can you think on your feet? 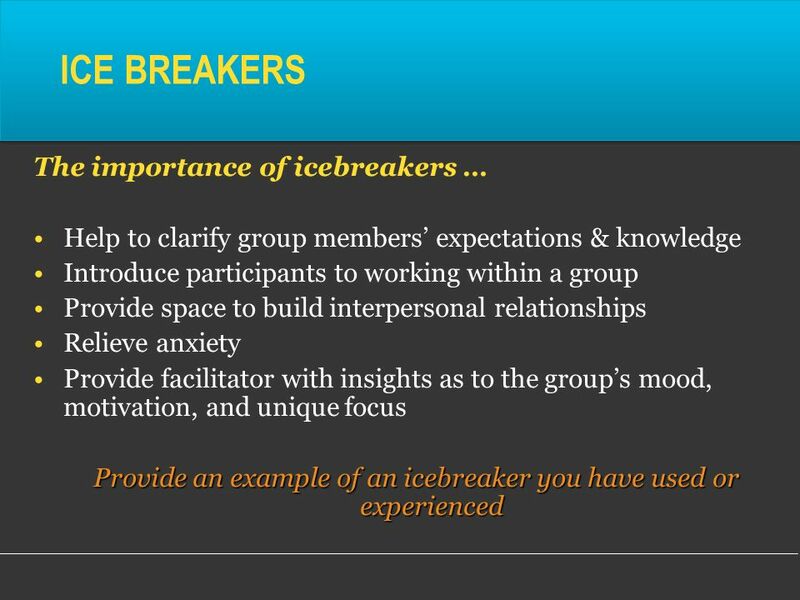 Do you believe that groups working together are smarter than individuals working alone? Can you accept feedback from others about yourself? 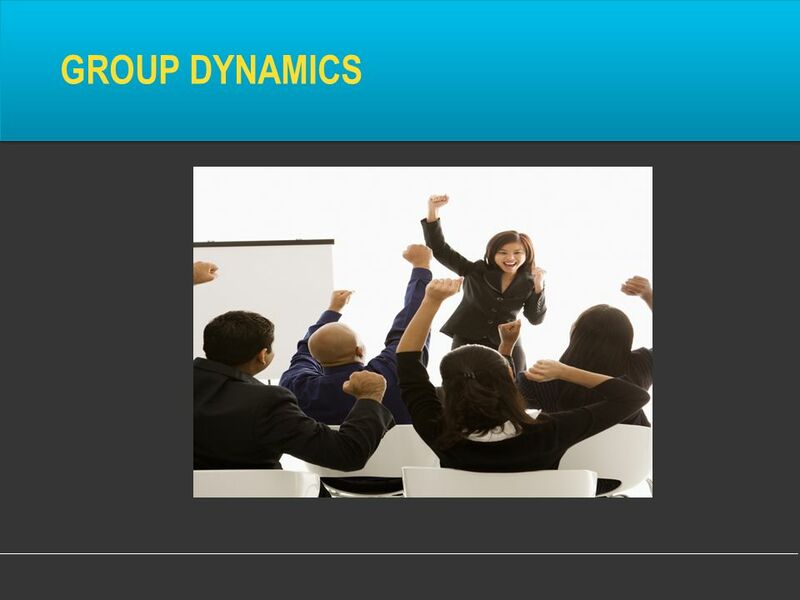 26 Group Dynamics Group dynamics refers to the understanding of the behaviour of people in groups that are trying to solve a problem or make a decision. 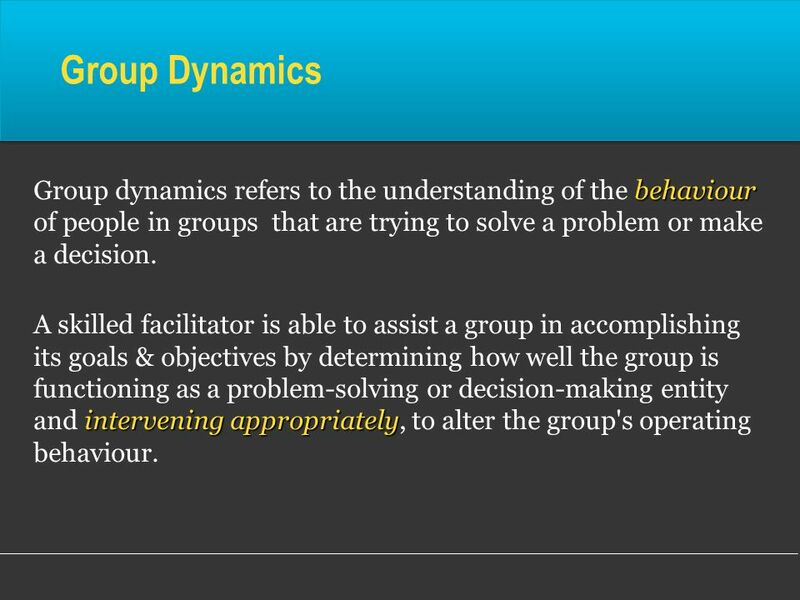 A skilled facilitator is able to assist a group in accomplishing its goals & objectives by determining how well the group is functioning as a problem-solving or decision-making entity and intervening appropriately, to alter the group's operating behaviour. 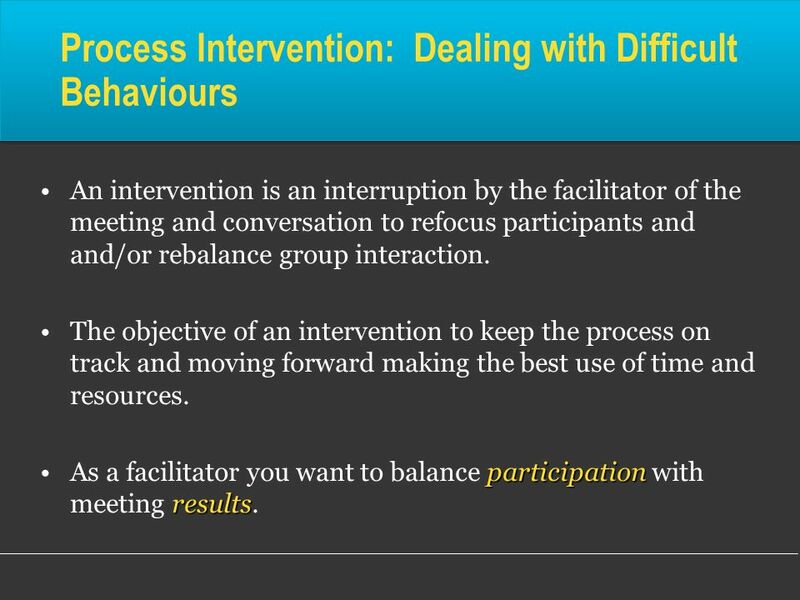 An intervention is an interruption by the facilitator of the meeting and conversation to refocus participants and and/or rebalance group interaction. The objective of an intervention to keep the process on track and moving forward making the best use of time and resources. 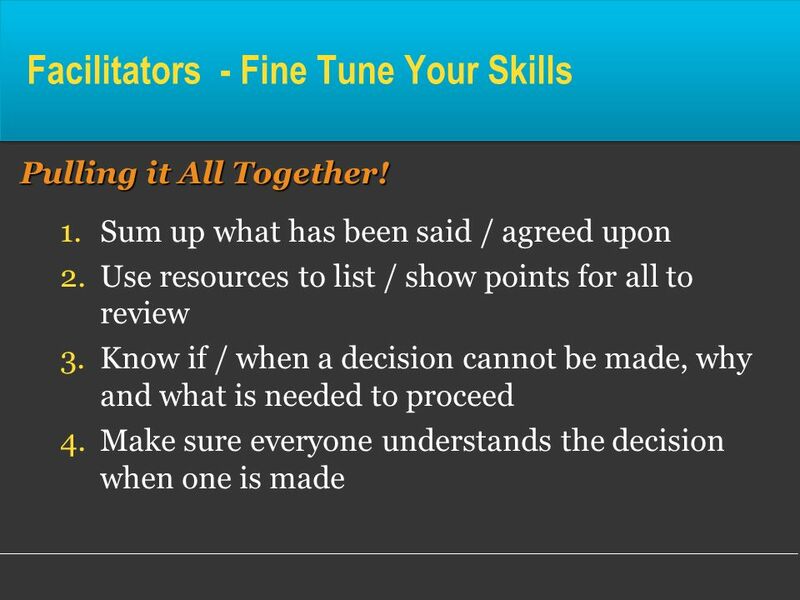 As a facilitator you want to balance participation with meeting results. 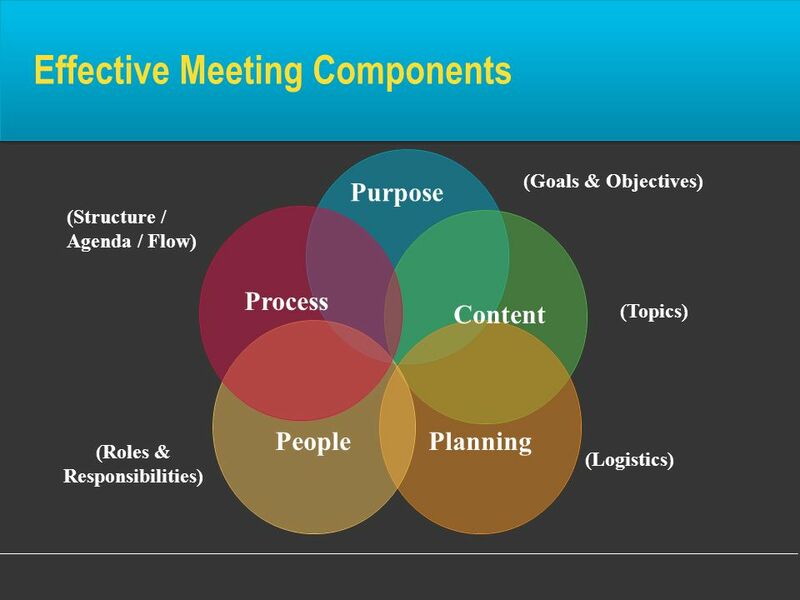 What were your meeting objectives? What worked well? 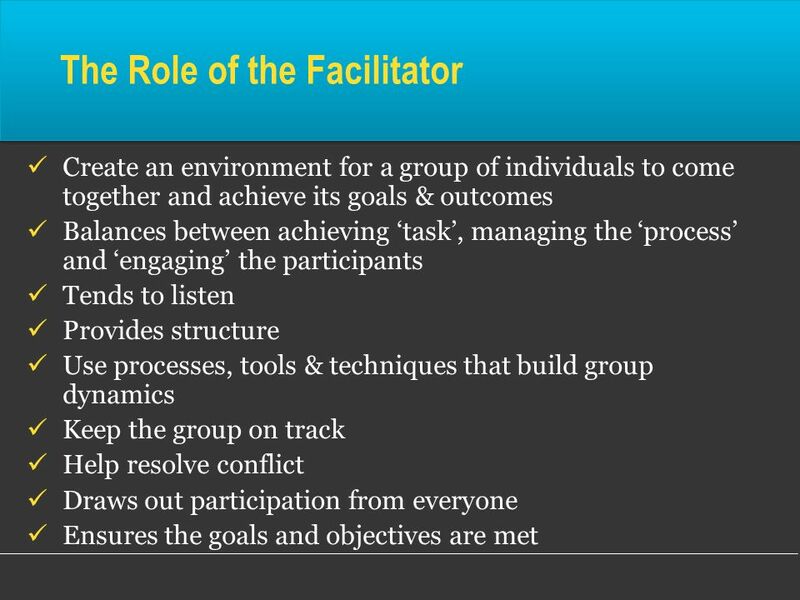 What challenges did the ‘facilitator’ experience? What changes would you make? 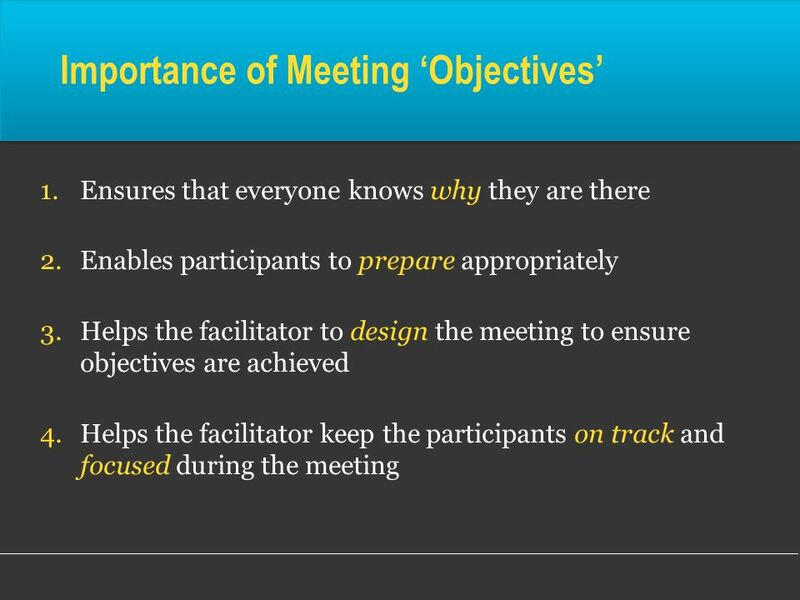 Were the meeting objectives met? What worked well? 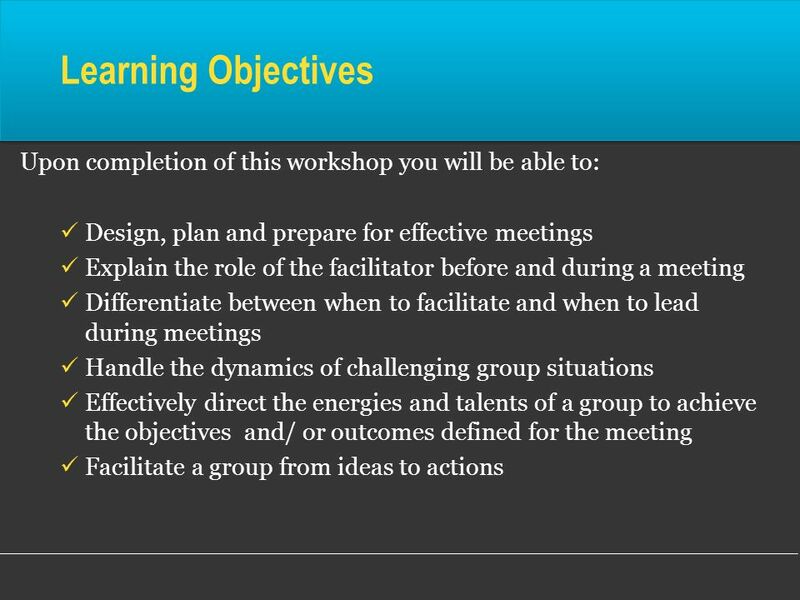 As facilitators, what challenges did you experience? As participants, what new challenges did you experience? 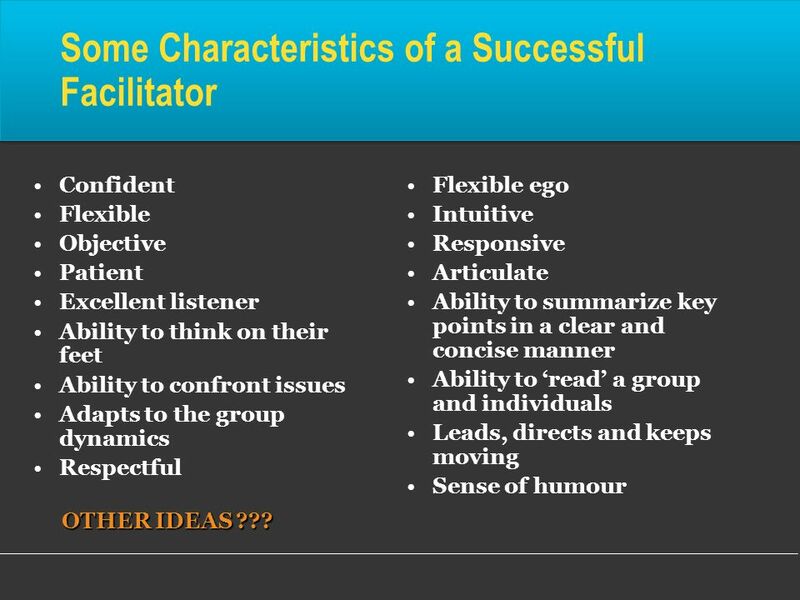 What would you do differently as a: facilitator? participant? 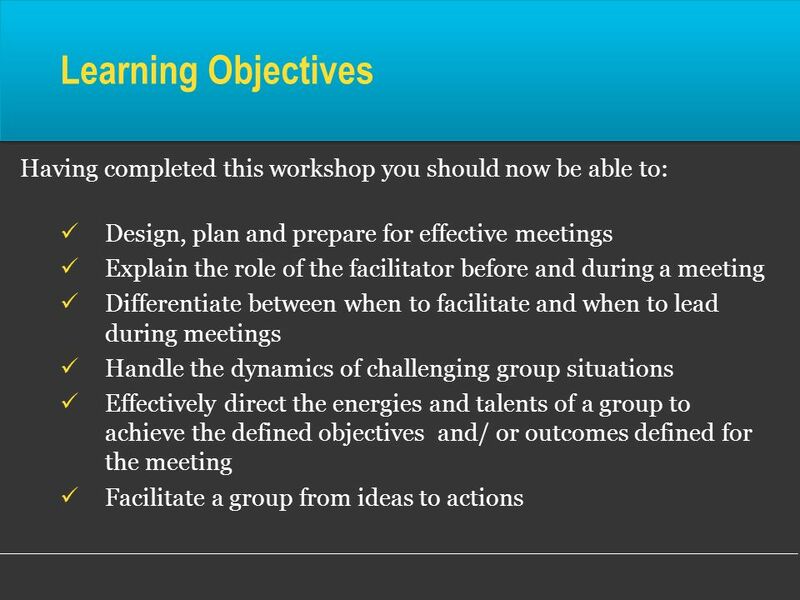 Did any of the participants help with the group process and intervene? How? What happened? 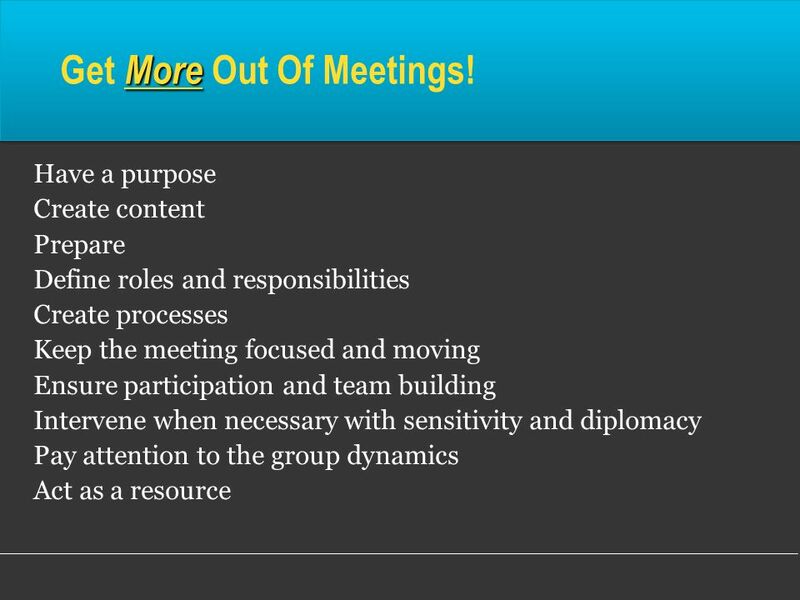 35 Get More Out Of Meetings! 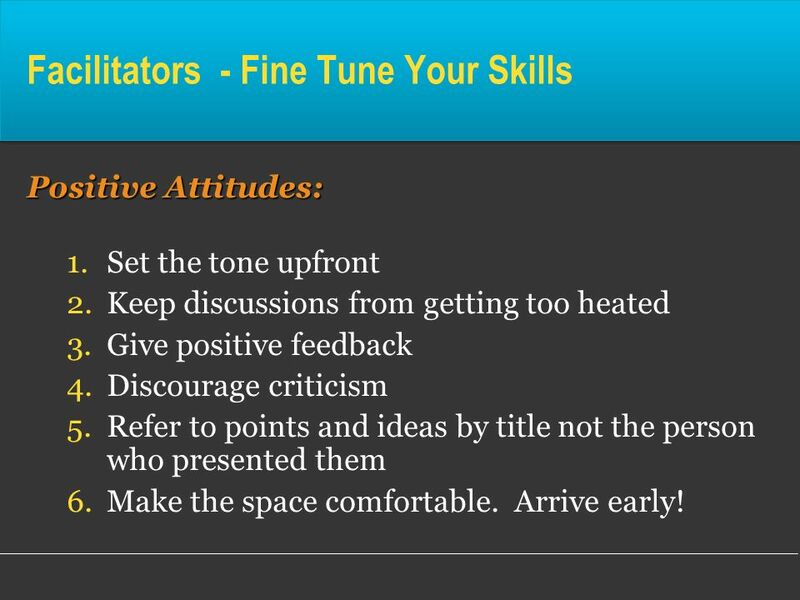 Positive Attitudes: Set the tone upfront Keep discussions from getting too heated Give positive feedback Discourage criticism Refer to points and ideas by title not the person who presented them Make the space comfortable. Arrive early! 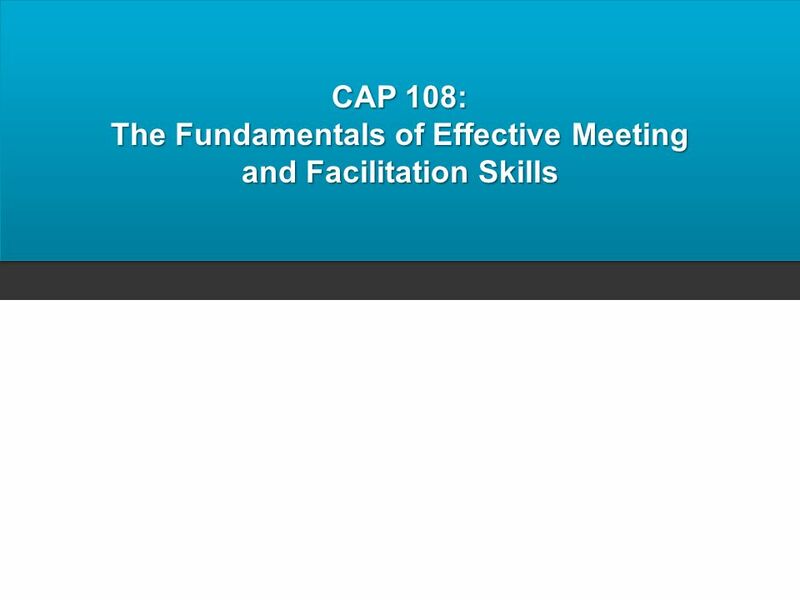 Download ppt "The Fundamentals of Effective Meeting and Facilitation Skills"
1 Copyright © 2011 by Mosby, Inc., an affiliate of Elsevier Inc. Chapter 20 Supervising and Evaluating the Work of Others. Effective Strategies and Process Prepared for the Walmart Foundation, AIHEC, HACU, and NAFEO Student Success Collaborative Meeting at Sitting Bull College. 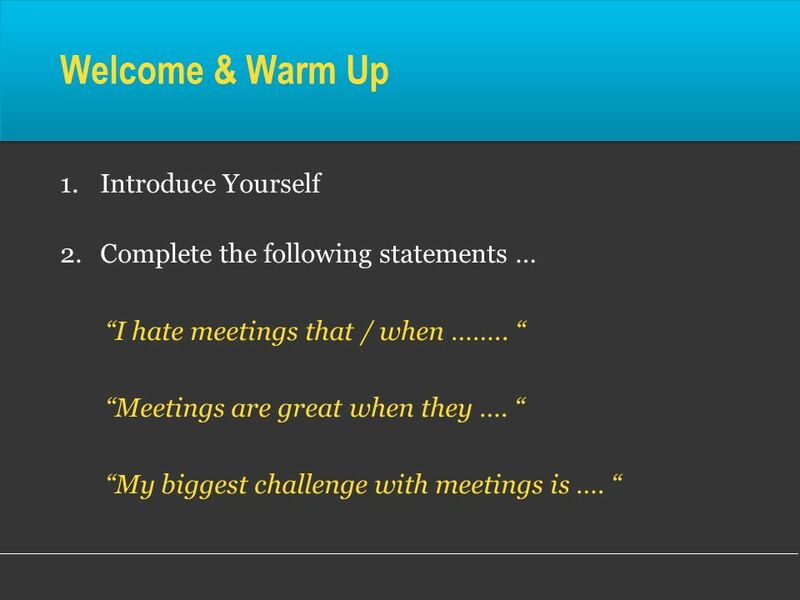 Stephanie M. Glyptis April 5, 2014 Let’s Meet: The Essentials of Great Meetings. Practical Skills for Leaders Archdiocese of Cape Town Centre for Pastoral Development. 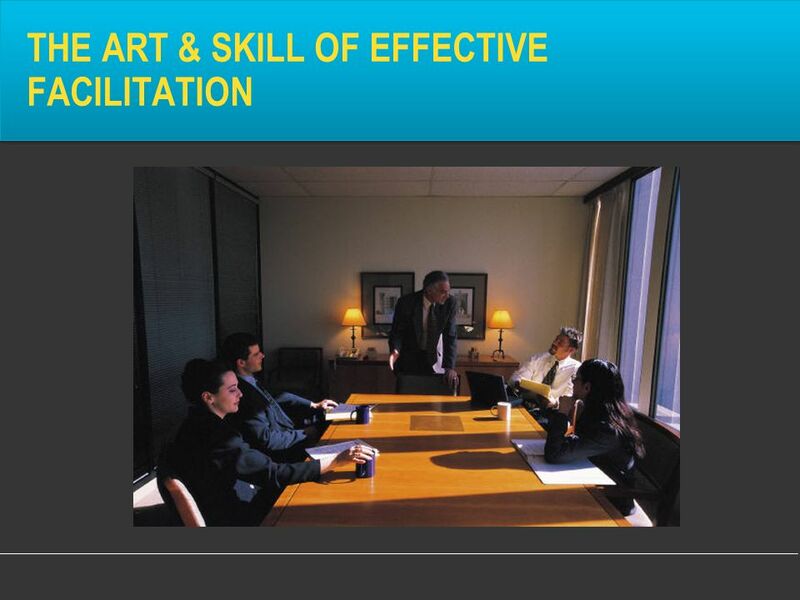 Building Team Facilitation Skills Presented by: Mary Jo Meyers M.S. What is Teamwork & Team Building Team work : Concept of people working together as a team. Team Player : A team player is someone who is able to get. 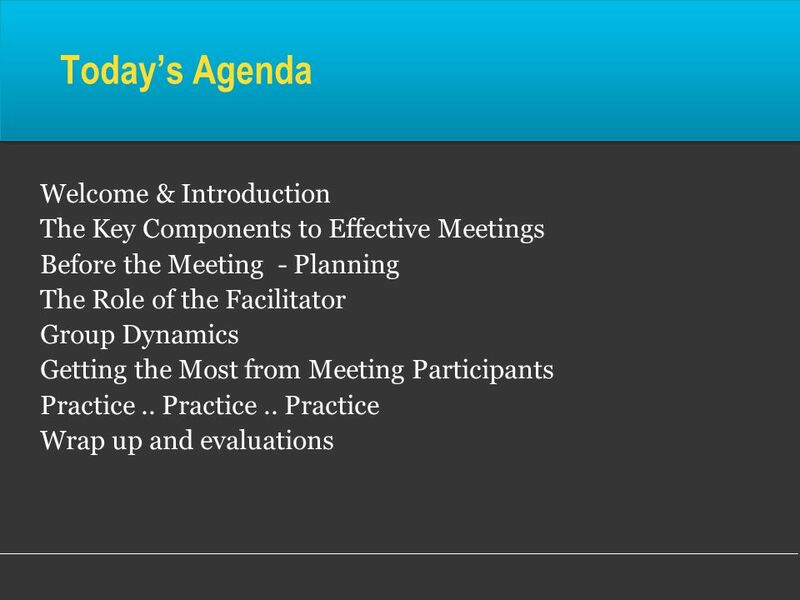 How to Run an Effective Regional Board Meeting. 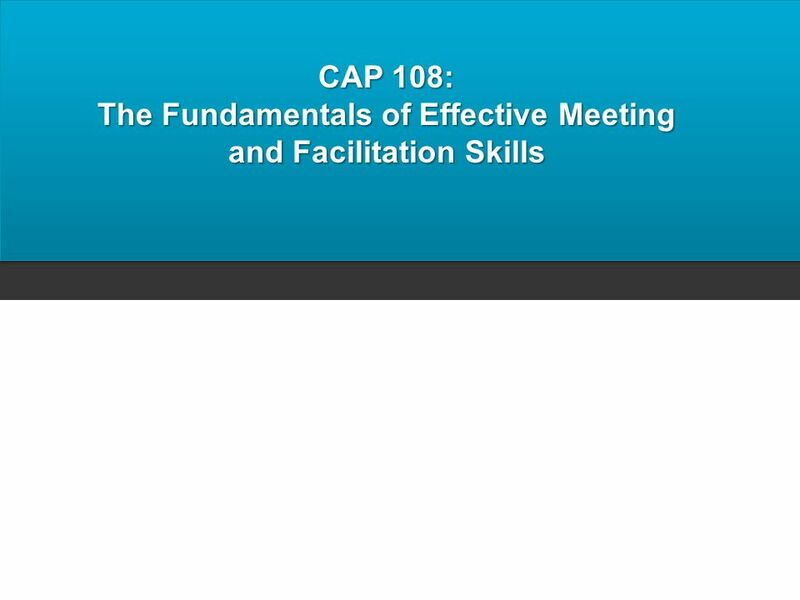 Self-paced version Use mouse click to advance the slides.